Last year’s finalists Arsenal and Hull were the first two teams to be plucked out of the hat during Monday evening’s FA Cup third round draw at ‘The Deep’ aquarium in Hull. Meeting between the two teams at Wembley Stadium last May saw Arsene Wenger’s Gunners run out as 3-2 winners in a thrilling Final. Hull coach Steve Bruce said: It’s an amazing draw, so let’s hope it’s as good a game as last season’s Final. 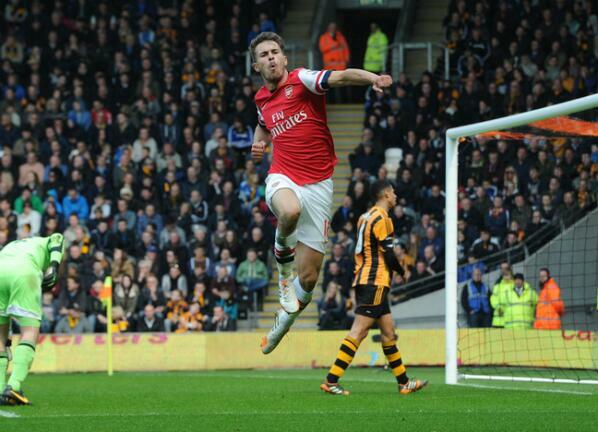 Aaron Ramsey Celebrates His Goal Against Hull City With a Fist Pump. Image: Getty. “I was convinced we were at home – we drew against them a few weeks ago in the league and now it’s the FA Cup so let’s see if we progress. Kenneth Omeruo’s Middlesbrough will face either Barnsley or Chester FC, while Huddersfield Town are up against Hope Akpan’s Reading. Other all-Premier League team clash has Everton against West Ham, Tottenham Hotspur at Burnley while Leicester City hosts Newcastle. Kenyans Headline Stellar Prefontaine Classic Steeplechase. Maria Sharapova Withdraws From the US Open. Bolt Strikes Back At the Bislett Games in a Meeting Record Time.